To lease or not to lease: The Santa Barbara City Council entered the national debate on offshore oil drilling this week, voting, for what it's worth, to maintain the status quo: no new leases. 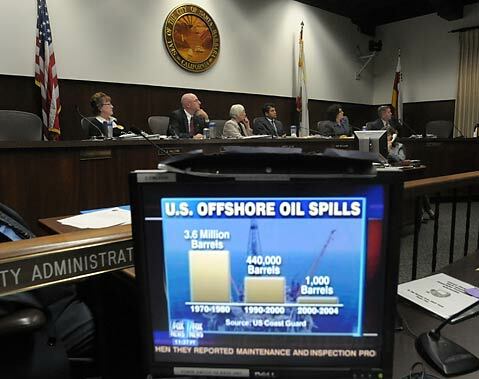 In a three-hour hearing, which included many of the same players and all of the same arguments and emotional rhetoric as the aforementioned supervisors’ discussion, a pro-oil lobby led by Santa Barbara’s own Stop Oil Seeps-a group that believes oil harvesting would decrease destructive, naturally occurring oil seeps-and the Western States Petroleum Association argued that an end to the moratorium would create cheaper prices at the pumps, millions in potential royalty revenues, and a markedly cleaner South Coast environment thanks to the less than fully understood correlation between drilling and seepage. On the other side of the fence were public speakers from groups like Get Oil Out, the Community Environmental Council, and the Environmental Defense Center who countered that not only would new drilling have a debatable impact on local oil supply and expose Santa Barbara to an increased chance of an ecosystem-destroying disaster but it also prevents us from moving toward more renewable energy sources like solar, wind, and hydrogen. For his part, there have no public indications that Schwarzenegger intends to waiver from his longstanding stance against new oil and gas leases in either state or federal waters. The City Council’s proclamation this week joins a growing chorus of opposition to expanded oil hunting off the coast of California. In the fallout from the county supervisors’ controversial letter to Governor Arnold Schwarzenegger, not only did the dissenting members of the board, supervisors Carbajal and Wolf, send their own missive to Schwarzenegger asking that he keep the longstanding bans, but three former Santa Barbara County supervisors-Susan Rose, Naomi Schwartz, and Gail Marshall-also penned a letter to Schwarzenegger dubbing the current supes’ vote a “misguided, ill-advised, and factually erroneous decision.” Additionally, according to the California Coastal Protection Network’s Susan Jordan, more than 50 environmental organizations from around the country were similarly spurred to action by the supervisors’ now infamous vote, sending likeminded letters of discontent to Schwarzenegger in the past two weeks. For his part, there have no public indications that Schwarzenegger intends to waiver from his longstanding stance against new oil and gas leases in either state or federal waters. Looking to send the anti-oil exploration message all the way from Sacramento to Washington, D.C., the California State Legislature resoundingly passed a joint assembly resolution (AJR 51) last week, requesting that the United States Congress renew the now 27-year-old moratorium on offshore oil drilling despite President Bush’s urgings to the contrary. (In July, the President lifted the executive ban on offshore exploration in federal waters.) Introduced by Santa Barbara’s Assemblymember Pedro Nava, the resolution, which was passed along to Congress this week, cites the environmental risks associated with drilling, along with the importance of a healthy coastline to California’s economy, as reasons to maintain the ban. With the current federal moratorium set to expire on October 1, Congress is debate renewing the ban this week, on September 12 as the Senate begins a bipartisan energy summit.